Finally Spring is here!! Spring is my favorite time of year especially here in Virginia where all the fruit trees are in bloom! 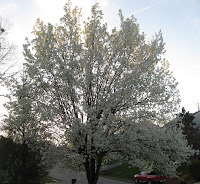 I have two pear trees in my front yard and right now they are covered in breathtaking little white flowers! Here is a wonderful Etsy collection of Spring items from many wonderful and talented people in my teams!